just missing the light and whistle. . .
One of the more bizarre things that came out of the EU was an attempt back in the 1980s to make us motorcyclists safer by imposing all sorts of ill thought out protective features on us and our motorbikes. I say protective in the loosest possible sense, because at least some of the ideas mooted were conclusively shown to actually be far more dangerous than having no protection at all. I mention this as context for some of the comments which follow. Airbags in cars aren't new. The Americans started fitting them in the 70's though it wasn't until 1987 that Porsche (surprisingly) released the first car with driver and passenger airbags as standard. It was the 944 Turbo, should you be wondering. And the rest, as they say, is history. These days even the most prosaic family runabout has airbags aplenty. My car has no less than twelve, which is a bit over the top but there you go. For us bikers, though, it's taken a bit longer. Soem of the original airbag designs had them fitted to the bike in various places - indeed some still do - and while that may well work admirably in some of the more traditional motorbike vs car scenarios there's a potential flaw. If the airbag stays on the bike then when you part company with it you also part company with that lovely impact resistant bubble. A few years ago Dainese came up with a self contained airbag built into a race suit and initiated by a lanyard attached to the bike. Alpinestars followed suit, and as technology evolved so did the kit. Now racers (and deep pocketed road riders) get a suit with a set of accelerometers in the hump that feed data to a small computer. This works out when you've crashed (or, more pertinently, are about to crash) and fires the airbags built into the suit, converting the rider into a leathery but otherwise quite convincing replica of the Michelin Man. Successive iterations of these suits have become better and better, and now they are both reliable and very safe. Enter Helite, stage right. 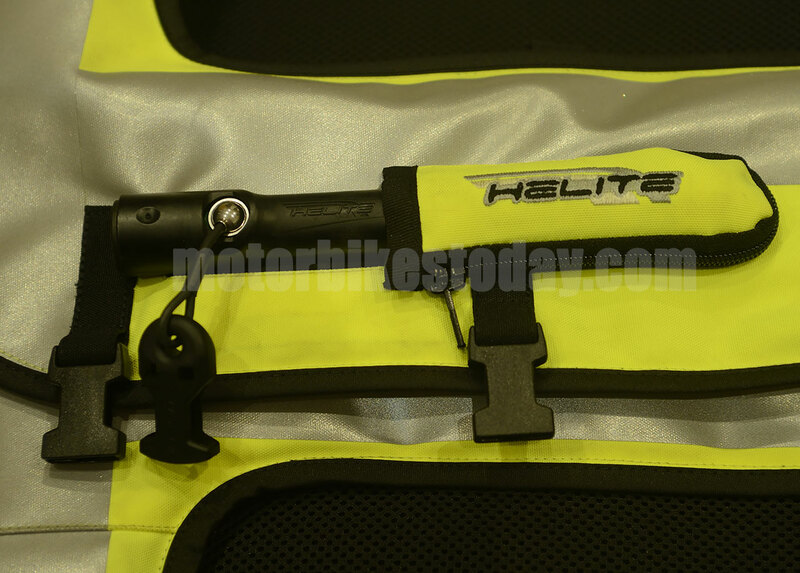 Helite make self contained motorcycle airbags. Actually, that's not strictly true. They make self contained personal airbags called airvests. They do them for motorcyclists, snowmobilers, quad riders, horse riders and pedal cyclists. The airvest contains no electronics, it's repackable by anyone with a tiny bit of common sense, it's utterly portable between transport (yes, I could wear a motorbike airvest on a horse if I wanted to) and it's relatively inexpensive. It also doesn't require the user to ride a sportsbike or be prepared to look out of place on a cruiser with Rossi-replica leathers. Let's look at the design first and then go into it all some more. This oarticular airvest is called a Turtle. I'll explain why in a bit. Uninflated it looks very much like the life jacket that you'll find under the seat on your next passenger flight - it's inflated by pulling sharply on the strap, but as per the title it's missing the light and whistle for attracting attention. And the inflation tube your cabin crew may gesture at suggestively. A closer look reveals that the back also contains a hard, CE marked back protector. The airbag is actually between the shell and your spine, hence the Turtle name. When inflated the airbag covers your chest and back, comes over your shoulders and up the sides of your neck. If it's the right size then the vest comes roughly halfway down your bum, so when it's inflated it also protects the pelvis. The vest is attached to the bike by a length-adjustable piece of webbing. Part of it is elasticated to give you, the rider, a bit of flex to move around on the bike without turning into M. Bibendum. This lanyard is attached to something solid on the bike and clips onto the vest using a solid but easily released clip. So far so good. But not, happily, in anger yet. 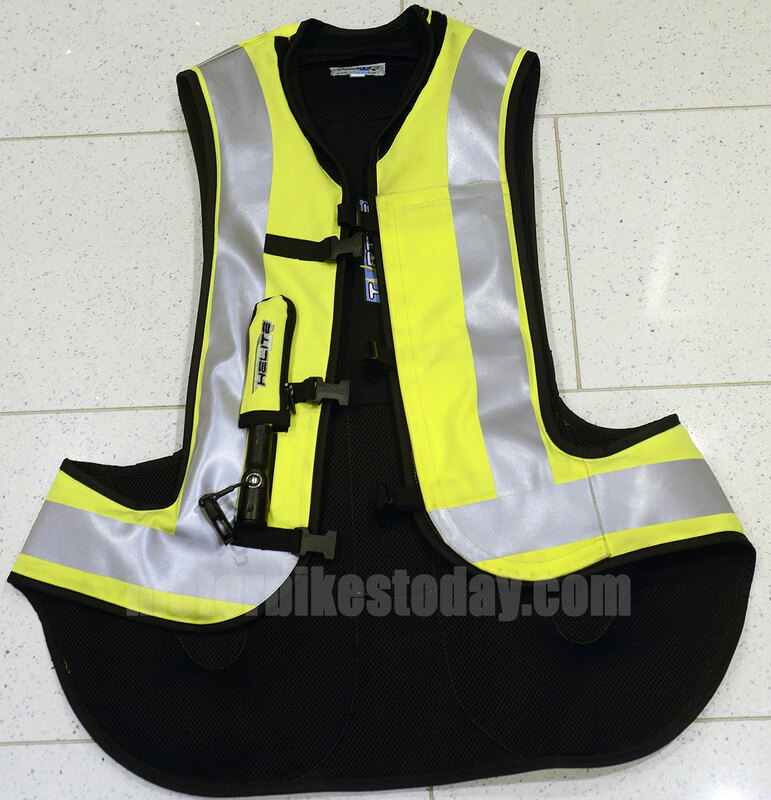 The vest is very easy to put on - it has three snap buckles on the front to do it up and the lanyard clip on the front right. This particular one is dayglo yellow, which isn't always my thing. But combined with a white helmet and the odd lumps and bumps on the vest it does rather give the impression of being a tiny bit more official than I actually am and adds to the passive safety element. Or maybe it's an illusion, I don't know. It can't do any harm to be seen though, right? I've attached the lanyard to a piece of the frame under the rear seat - good in that it's out of the way, not so good in that the first time I tried to use it I got all crossed up and ended up dropping the bike. No damage apart from to the delicate sensibilities of any young animals in earshot, but annoying. Second time was dead easy and so it continues. Once you're on the bike you don't notice the vest is there really. If it's too long or you sit funny it sometimes fouls the back of your helmet and makes it harder to lift your head up, but I think that'll go with time. It probably adds 5 seconds to my boarding time now. And so far I have failed to set it off when getting off the bike, despite the fact that I've forgotten it's there every single time and only stopped when I felt the lanyard tighten. I guess that alone makes it the perfect bit of protective equipment - you don't notice it until you need it. OK, so what does it do, and how? It's actually really quite simple. Let's assume you're wearing the vest and it's all done up. 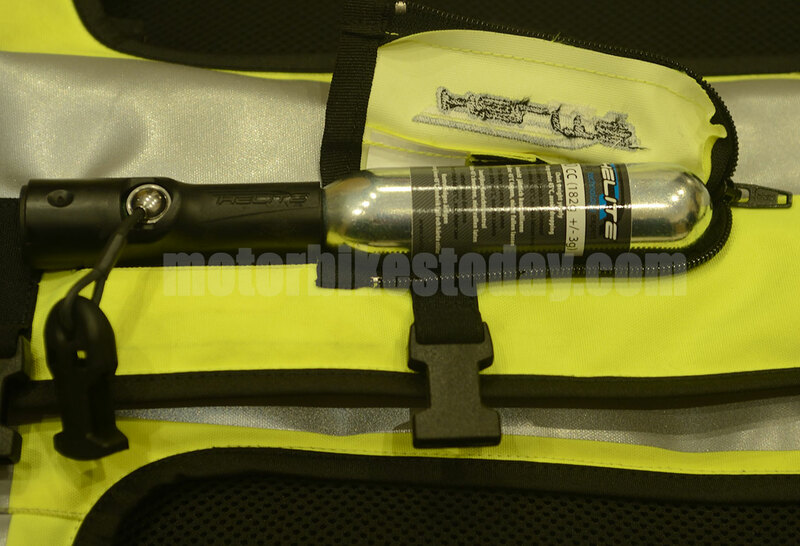 There is a partly elasticated webbing strap or lanyard which you attach to a convenient point on the bike. It needs to be solid, so we're looking at a frame rail or seat mount or something. NOT (it's important) bodywork. 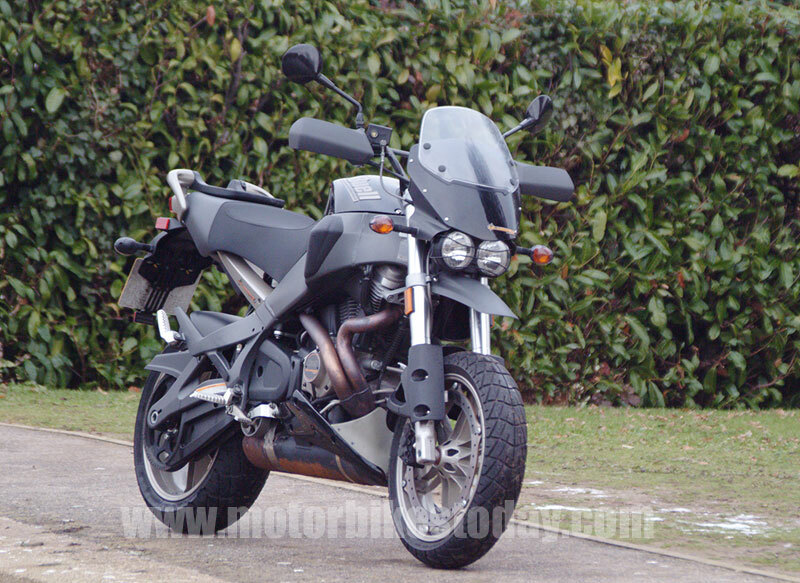 Mine is attached to the cross rail that the pillion seat latches onto. That lanyard clips onto a fastener on the front right of the vest, by the gas bottle. That fastener is in turn attached to a ball-bearing which is partly inside the hard bit where the cartridge goes. The cartridge itself is like a large Sodastream canister, about four inches long and a bit over an inch across (say 100mm by 30mm), Under normal circumstances that ball allows the lanyard to swivel and the elasticated bit makes sure you've got plenty of freedom to move. Get to your destination, unclip the lanyard and off you go. Chances are you'll forget to unclip. That's probably OK as it needs a hefty tug to set it off, so you'll need to be getting up really quickly to be a problem. You'll also probably forget to clip it on a few times. That's OK as well. While it obviously won't work, the lanyard should be short enough not to get eaten by a wheel or anything unless you've been very creative indeed with where you've put it. Almost every journey you make will end up with you taking the unused vest off an stowing it with the rest of your kit. You will, in fact, genuinely forget you are wearing it after a while. But one day that myopic driver is going to turn across you or that tourist os going to look the wrong way or, heaven forbid, you're going to run out of road shortly after running out of talent. Or grip if you prefer. Whatever the circumstances, you find yourself parting company with your bike and a mere slave to physics. At this point one of your first thoughts should be "Glad I put my Airvest on." If it's "Nuts, forgot my Airvest" or similar please feel free to skip the next part. Assuming you have indeed clipped the Airvest to its lanyard, and assuming you weigh more than 30kg, which is the load needed to fire the vest, as you part company with your bike the lanyard will go tight and will take all your weight and motion through it. Which is why it needs to be attached to something solid. The lanyard will pull the ball-bearing out of its snug little holder and the spring loaded plunger which sat behind it will suddenly be free to unload itself. Which it will do, piercing the end of the gas canister and inflating the Airvest in a fraction of a second. The vest will burst out of its dayglow containment like a hungry alien seeking daylight and cats, and you will find a number of things. The vest is really quite tight. You can't move your head. I mean you really can't move your head. After inflation the vest goes down slowly. This is deliberate - unlike a car airbag which deflates almost immediately. Because after the first impact you may still be sliding along the road and may fetch up against something solid. It the Airvest has deflated then it won't really be much help. So it pushes that rigid spine protector awaty from your back, maximising protection there. It inflates over your shoulders, locking your head in place and minimising the risk of overextending your neck (a common cause of upper spine injuries for us). It extends to halfway down your bum, protecting the most vulnerable bits of your pelvis at the back as well as the very base of your spine. And on the front it covers most of your chest - certainly enough to mitigate impacts there as well. At the bottom of the page you'll see a video of the vest in action. No, I didn't carefully set up my onboard camera to track me as I piled into a car, but I did do a reasonably scientific test. It should explain everything I've said earlier far more eloquently than my words. So let me sum up. This particular flavour of Airvest (and there are several versions) retails at between £500 and £550, depending on the size. The original version is cheaper but lacks the hard back protector. You can also get a track version which is shaped to fit around a race suit hump, and that retails at £650 to £675, again depending on size. The vests are available in black as well as flouro yellow, but there's no price difference. it's worth mentioning that there is also a custom version, meant more for the Harleyesque market and better suited to very upright riding positions, which retails for £600 to £625, depending on size. Replacement cylinders are £20, and a replacement lanyard, should you ever need one, is £27. That makes them very, very good value to reuse. But the price is rather less important than the quality and value - let's face it, the vest could be a pound but if it doesn't work it's a pound wasted. Now I must stress that at the time of writing this I haven't used this vest in anger (and do not intend to). But. I've worn it just about every day since it arrived on my commute across London, and can confirm a few things that are important. It's really easy to use. I mean really easy. It literally adds five seconds to my getting on and off the bike. It's comfortable to the extent that I usually forget I'm wearing it. Both of these points are really important, because if something is a pain to use or it's uncomfortable then it won't get used. 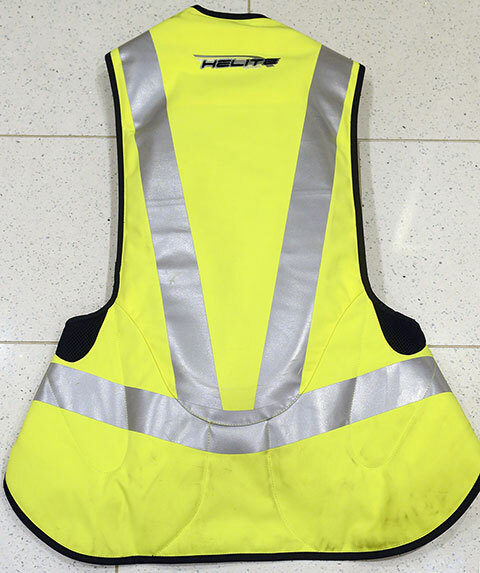 And I genuinely believe that, in the event that tomorrow morning an Uber driver finally manages to get me while checking their navigation system for the next fare and failing to look outside, this vest will at least minimise the injuries I receive if not eliminate them entirely. Bottom line? I'll be paying my own money to kepp this vest, even after setting it off. And I'll be wearing it all the time. You can get yours from https://www.airvest.co.uk assumimng you're in the UK. You can also get advice from the very helpful team there on exactly what is best for you. Do it, Seriously - it might save your life.